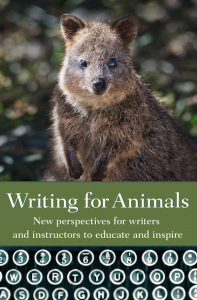 Paula MacKay’s essay “Rewilding Literature: Catalyzing Compassion for Wild Predators through Creative Nonfiction” appears in Writing for Animals. A: I’ve come to recognize that creative storytelling about animals (and people) is key to wildlife conservation. Early in my career, my writing tended to be more journalistic and scientific: magazine and journal articles, newsletters, op-eds, and the like. But as I’ve become more knowledgeable about wildlife through my work in conservation and field biology, I’ve increasingly found myself trying to imagine life and landscapes through the eyes of the animals I study — and wanting to share this imaginative empathy in my nonfiction writing. A few years ago, I enrolled in the MFA program at Pacific Lutheran University to learn how to improve my craft so that I could inspire readers about wildlife in a more compelling and personal way. This is a work-in-progress, and I still very much value science and science-informed writing. But I hope my writing continues to evolve such that I can help inspire readers to love and care about our wild neighbors through their hearts as well as their minds. A: We shouldn’t be afraid to let our passion for animals shine through. Of course, we can never truly know what it’s like to inhabit an Other’s reality — and, in the case of nonhuman animals, we should take care not to project too much humanness on the animals we’re writing about (for example, my sense is that malevolence is mostly a human attribute). Nonetheless, I think it’s important to recognize the intelligence, social and family bonds, curiosity, personalities, and other remarkable traits of animals in our writing, and to reveal our own inner worlds as they relate to animals so that readers can emotionally connect with us, our stories, and the animals themselves. I’d also like to recommend Wild Hope magazine—a relatively new publication (to which I contribute) that does an excellent job of blending wildlife science and storytelling. Q: In what ways can humans use nature to reconnect with animals, both on and off the page? A: My time in nature — local forests and beaches, and especially wilderness — is key to reconnecting with other animals and myself. The human world is full of distractions and distressing events these days, which create so much inner noise that it can be difficult to hear ourselves think or to tune into the sounds of nature. When I walk through the woods or in the mountains, I’m reminded that there are many, many realities out there (imagine the life of a woodpecker or a wolverine! ), not just the personal and political realities that tend to occupy my mind, and I find a sense of peace that escapes me on the streets of Seattle. With this quietude, I feel a deep communion with other animals and the inspiration to give them voice in my writing. Paula MacKay completed her MFA in Creative Writing at Pacific Lutheran University in 2015. For the past seventeen years, she has surveyed bears, wolverines, wolves, and other wildlife with her husband, Robert Long, with whom she co-edited Noninvasive Survey Methods for Carnivores (Island Press, 2008). 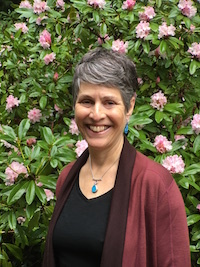 Paula has written about animals and conservation for numerous organizations, scientific books and journals, and magazines. Her essay “My Sister’s Shoes” was recently published in Siblings: Our First Macrocosm.